Hortonworks is Hadoop focused on Open Source distribution within the IT market, with the main goal being to drive all their innovations to the Open Source platform and build an ecosystem of partners that speed up this process and the adoption of Hadoop with Enterprise. Its strongest features, over and above being Open source, include its cloud integration and its strategy. Where cloud integration is measured through its partnerships with cloud providers and integrated cloud services. Strategy relates to its ease of acquisition and solutions road map. Hortonworks has tried to position themselves as an addition to traditional Data Warehouse with the idea of running in parallel to existing systems. Cloudera ranks at the top in big data vendors for making a reliable Hadoop product for business and focuses on providing enterprise ready solutions with additional support and training. Cloudera’s approach to innovation is to follow core Hadoop but to also innovate quickly to meet customer demands, market trends and try differentiate themselves from other market vendors. In a comparison matrix, Cloudera ranks strongest on strategy (ease of acquisition and solutions road map), but weakest on Cloud integration (partnerships with cloud providers and integrated cloud services). Cloudera has tried to position themselves as a replacement to traditional Data Warehouses, by providing SQL on Hadoop as well as all the other big data services. 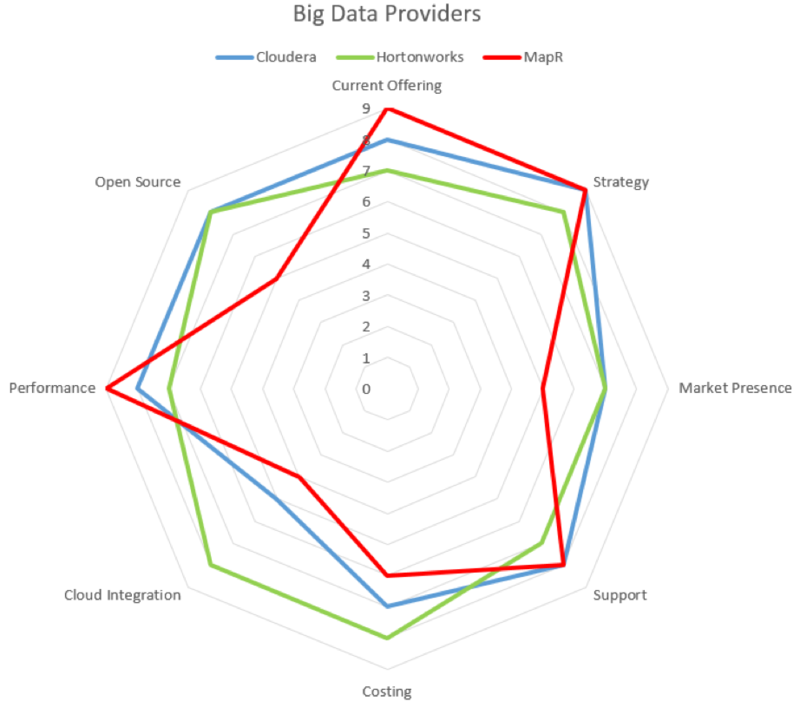 MapR has a different approach to their Hadoop stack framework when compared to Cloudera and Hortonworks. This is largely because MapR have their own File System, Database and streaming service aimed at enterprise grade with a large majority of services omitted from the free edition and only available on the enterprise version. Both Cloudera (except for 2 services) are fully available on their free versions. On the comparison matrix, MapR’s performance is exceptionally strong as is its current offering (Solution Architecture, Administration Capabilities, Security, Data Governance and Development) and strategy. However costs are high and its market presence (Product Revenue, Customer Base, and Partnerships) is far lower than its competitors.